Capitalizing on a popular streetside trend, two Hawaiian airports are using small battery-powered versions of the food trucks that have taken many North American cities by storm in the last few years. Two food wagons, decked out in fun Hawaiian-style motifs, have been traveling Honolulu International Airport (HNL) since summer. The festive vehicles serve hot, made-to-order tacos from the back in addition to selling a variety of pre-made sandwiches, salads, snacks and beverages. The Wiki Wiki Wagon services the EWA Concourse, and the E Komo Mai Wagon travels the Diamond Head Concourse. The Wiki Wiki Wagon at Kahului Airport on Maui carries only cold pre-made options. Airport and concessionaire officials say the wagons provide a new way to reach passengers who like to get to their gate and stay there. Customers report that the mobile concessions are a fun way to get something to eat-without losing their holdroom seat. "We want our passengers to feel comfortable and relaxed, and a big part of that is making sure they have great dining options to choose from no matter where they are in the airport," says Ross Higashi, Deputy Director, Hawaii Department of Transportation - Airports Division. "HMSHost's new mobile wagons at HNL meet that demand by providing a handheld meal that is customizable, fast and hot." Each day, HNL's wagons travel between gates, focusing on areas with high concentrations of departing passengers. The vehicles also sometimes service gates where long flights are arriving, to provide passengers with hand-held meals or snacks they can eat while walking toward the baggage claim area. HMSHost, which also holds contracts for more traditional fixed concessions at HNL, launched the taco wagons to reach passengers who feel most comfortable sticking close to the gate when waiting for their flights. "There are different types of travelers out there," says Jeff Steelman, Vice President - Culinary for HMSHost Corporation. "Some like to have a cocktail, others want a sandwich and others want a sit-down meal. And then there are the travelers who want to get to their gate as fast as possible, get a seat and stay there even when the plane isn't even there. We have to cater to those passengers and give them what they want to eat, where they want to eat it. It's all about getting hot food to that traveler. And it's a lot of fun." 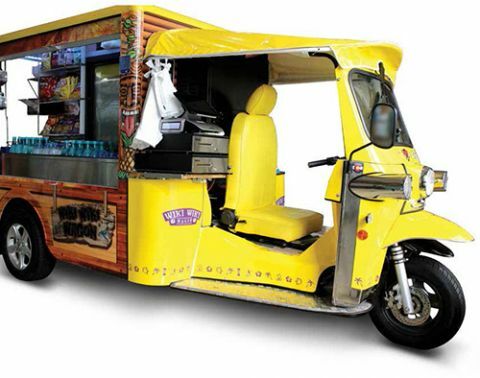 The mini food truck idea was a natural extension of the bicycle carts and food wagons HMSHost operates at Chicago O'Hare and Nashville International. HNL, however, was the concessionaire's first foray into using self-contained cooking units for offering hot food. "We really felt that this was the way to go," explains James Schmitz, Vice President of Innovation for HMSHost. "You see a lot of this type of food delivery innovation in Europe, and that's where we got the idea. Sometimes, there are high saturations of passengers but not enough food and beverage offerings for them. The taco wagons are another option for the traveler." HMSHost worked with eTuk USA and Rocky Mountain Inventioneering, both out of Denver, to create the unique food wagons. The vehicles use battery-supplied power for cooking, driving and refrigeration and are charged in traditional 220-volt outlets each night. A 110-volt inverter in each vehicle converts DC voltage into AC voltage to run the onboard equipment. When fully charged, the refrigeration, point-of-sale system and grill can operate for 17 to 18 hours without needing a recharge. Operators supplement the power for on-board refrigeration by plugging the wagons into terminal wall units during stops. The vehicles were manufactured by eTuck; Rocky Mountain Inventioneering provided and installed interior features such as refrigeration units and ice baths. Cleaning and food safety measures for the food wagons are the same as those required in commercial kitchens, notes Schmitz. Operators are trained to observe standard food temperature requirements and follow "clean-as-you-go" operational rules. Each vehicle is equipped with cleaning items and a self-contained hand washing station. To date, no health or sanitation problems have been reported, notes Schmitz. Meat is cooked in the airport kitchen and kept in warmers; tortillas are grilled on the panini-style cooking units in the back of each wagon. Tacos are made to order with barbecue chicken or Kalua pork. Additional choices include rice, slaw, onions, plum sauce and sesame seeds. Cold pre-made offerings include turkey and cheese sandwiches on multigrain bread; ham and cheddar on ciabatta; Caesar and Greek salads; fruit cups and yogurt parfaits. Items are regularly replenished on each cart. Two workers operate each wagon-one cooking and serving; the other handling cash and credit card transactions. Although HMSHost declined to release sales figures for the wagons, personnel note that the mobile concessions have exceeded the company's sales targets. In addition, Schmitz says it was easy working with HNL on the project and describes the approval process as "seamless." HNL's Higashi reports that he's heard nothing but favorable comments about the food wagons and says the novel vehicles help provide passengers with quality service. "The wagons can move from gate to gate wherever there are passengers waiting for their planes. So if a gate is empty, they will just move to another gate," he says. Schmitz notes that the wagons encourage interaction between travelers and the workers who operate the vehicles. "We wanted the offering to be something exciting to the consumer; we wanted the format to be fun," he explains. "We didn't just want to put a golf cart out there. That would have gotten boring. What we wanted to do was put out something that was exciting visually that really got the customer's attention with an exciting menu. We wanted something that would jump out. And customers like it. They love the entertainment value that it provides as well as the convenience."